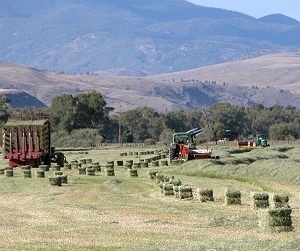 Most Timothy grass hay currently grown in Colorado, and Esty Ranch’s original Timothy hay, originated from the Climax variety, and Climax is believed to be the native northern European variety brought to colonial America from Scandinavia in the late 1600’s. The first recorded appearances of Timothy/Climax in America have been traced to early colonial settlements in New England. In the early 1700’s, the first of what is now globally called “Timothy” grass hay was recorded being grown in America for horse and cattle fodder by John Herd, a Maine/New Hampshire farmer. It was originally called “Herd’s grass”, and it quickly established a reputation as a superior horse feed, especially for riding horses that were frequently ridden long and hard. John Herd is credited with introducing Herd’s grass seed into the New York and New England colonies and into SE colonial Canada. The generic grass hay name “Timothy” came from the given name of a New England native, Timothy Hanson, who moved to the Baltimore, Maryland area and began farming there about 1720. It was reported that he used Herd’s grass seed to begin his cultivation of Timothy hay and seed in Maryland. The news of his “superior fodder” quickly spread, and he was soon concentrating on seed production (remember, horse hay was as critically important to America then as gasoline and diesel fuel are today). He is the first person recorded in America to grow, process (clean, grade and bag) and sell Timothy hay seed commercially, and Baltimore, Maryland is considered the commercial birthplace of Timothy grass hay seed. The awareness and popularity of Timothy grass hay (primarily for horses) grew rapidly in colonial America, and Timothy Hanson became a leading (if not the leading) Timothy seed grower, processor and distributor (he was a significant colonial American agricultural entrepreneur). He is credited with introducing Timothy hay, and selling its seed, extensively throughout the central colonies (primarily Delaware, Maryland, W New York, North Carolina, Pennsylvania and Virginia). In fact, he is sometimes referred to as the “Johnny Appleseed of Timothy hay”. Historical note: George Washington and Benjamin Franklin were both satisfied customers of Timothy Hanson’s hay seed, and it is Benjamin Franklin that is personally credited with originating the name “Timothy’s seed”, which soon became simply “Timothy”. Nutritional note: Recently introduced improved varieties of Timothy hay, such as Horizon, can be substantially nutritionally superior (especially when grown at high altitudes) to the original Climax variety, and, increasingly, are the only Timothy varieties fed to prize race, polo and rodeo horses. Think of generic “gasoline” in a simple “energy” comparison vs. generic “Timothy” hay. High altitude, premium quality Climax variety Timothy hay would be energy equivalent to low grade 87 octane gasoline, and high altitude, premium quality Horizon variety Timothy hay would be energy equivalent to premium grade 93 octane gasoline. Fundamentally, all Timothy grass hay “isn’t the same” anymore, as nutrition ( protein ) and physical plant structure can vary significantly between the old and new varieties, and discerning Timothy hay buyers/feeders are increasingly aware of the significant nutritional differences between them, and they have to individually decide which Timothy variety is the best value for their horses.